The Pugillon is not a purebred dog. 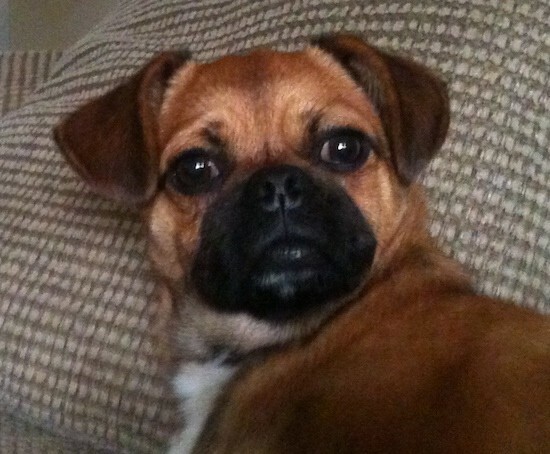 It is a cross between the Pug and the Papillon. The best way to determine the temperament of a mixed breed is to look up all breeds in the cross and know you can get any combination of any of the characteristics found in either breed. Not all of these designer hybrid dogs being bred are 50% purebred to 50% purebred. It is very common for breeders to breed multi-generation crosses. "Abby is 7.5 years old in this picture. 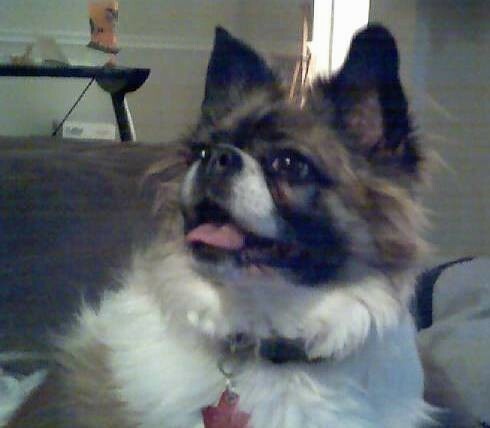 She is a Pug / Papillon mix. Her mother was a Papillon and her dad was the Pug. Abby and one other girl from the litter have Papillon fur the others had short fawn colored fur like the Pug. I think that this is a wonderful mix. Abby is so sweet and lovable. She adores all people and other dogs. She is also very intuitive and smart but has a silly demeanor. She’s pretty goofy. At 7 years old, she still loves to play with her toys, though she never destroys them. She likes to toss them around and wrestle with them. Abby is somewhat the mother hen to our other two dogs, a 6.5 year old Mini Pincher / Chihuahua female mix and a 2 year old Golden Retriever male." 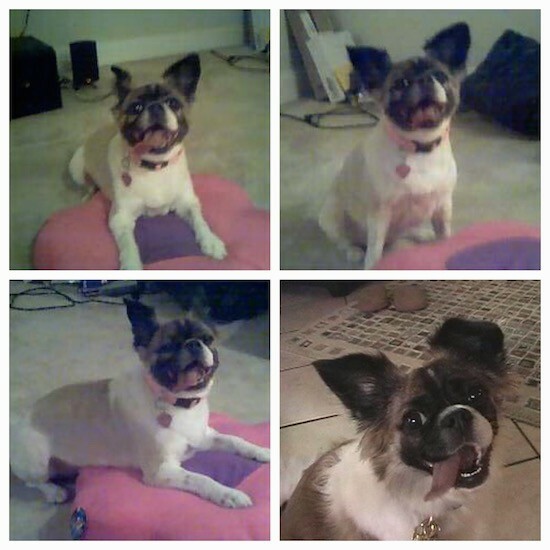 "In the first 3 pictures Abby is showing off her new haircut. With her hair short you can see her adorable little Pug body. Her hair grows long like the Papillon, shown in the last picture." "At this time Durc is only just over 3 months old so we are still very early in our adventures together, but he's been AWESOME!! 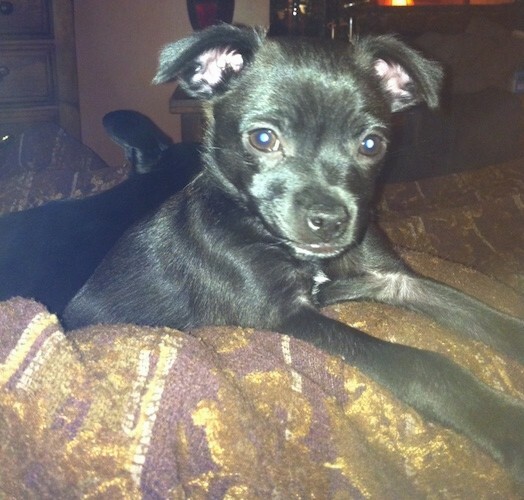 His mother was a 12lb black Pug, and his dad was a 9lb Papillon. Maybe just a little too smart for his own good, but other than that, he's been great. He makes it outside to do his business about 75% of the time already and is the biggest love bug ever. He is always excited to see people, even ones he doesn't know, and has done very well with all the animals he's met, even my chickens! I would never have thought a Pug and a Papillon would have made a good mix, but after doing some research, each breed seems to make up what the other lacks. Not only is this dog adorable, but hes also smart, companionable, and did I mention adorable? "